JaiBaba.com! Your Avatar Meher Baba Oasis on the net! - JaiBaba.com! Your Avatar Meher Baba Oasis on the net! Below you will find links to our featured speakers. "I am neither an aspirant, nor a follower, a lover, or a disciple - I am one of His children. And of one thing I am sure, He has accepted me." Bal Natu, was one of Meher Baba's Men Mandali and author of Glimpses of the God-Man Volumes I - VI, The Samadhi, Star of Infinity and many others. 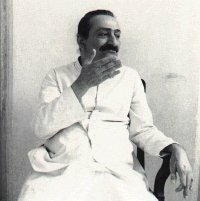 Bal shared with us a few short stories of Meher Baba's workings. If you would like to read one please click a link below. In the spring of 2001 anticipation for many Baba Lovers in the west turned to sadness when word spread that Bhau Kalchuri , due to illness would not be coming to visit America or England. During Bhauji's long recovery, a series of "Awakenings" have been coming to him directly, he says, from Meher Baba. These revelations which Bhau has called "Awakenings" have been circulated quietly through Babacyberland. Bhau has given JaiBaba.com express permission to post all of the "Awakenings" on this site. Here in from our Beloved through Bhauji are the "Awakenings." Maybe in a Baba way, sweet Bhauji has come to visit the west in 2001. Below is a small explanation written by Bhau on how these "Awakenings" began. "Actually, because my mind remains dead, I cannot put in words the deep down voice which I heard in my heart. At the time when I hear this voice, I feel Beloved Baba wants me to make it possible for His lovers to hear this. Therefore, though it is very difficult to put the voice in words, still I have tried. Deep down voice it is His voice and cannot be translated into words. Only love can experience it. It cannot be translated intellectually, but I have tried. I believe Beloved Baba has given such a good explanation of suffering through His voice in my heart, and His dear ones will like it. With all love to all the dear ones of the Beloved Baba. So he did not expect any fresh “Awakenings.” But Baba hews to His own schedule and timetable, and is ever the most surprising One of all! In forthcoming weeks, several new “Awakenings” will be circulated to His dear ones. "I have come not to teach but to awaken. Understand therefore that I lay down no precepts."